I want to marry this car. The end. Okay, well maybe you’re expecting a more thoughtful review. What a demanding group you are. 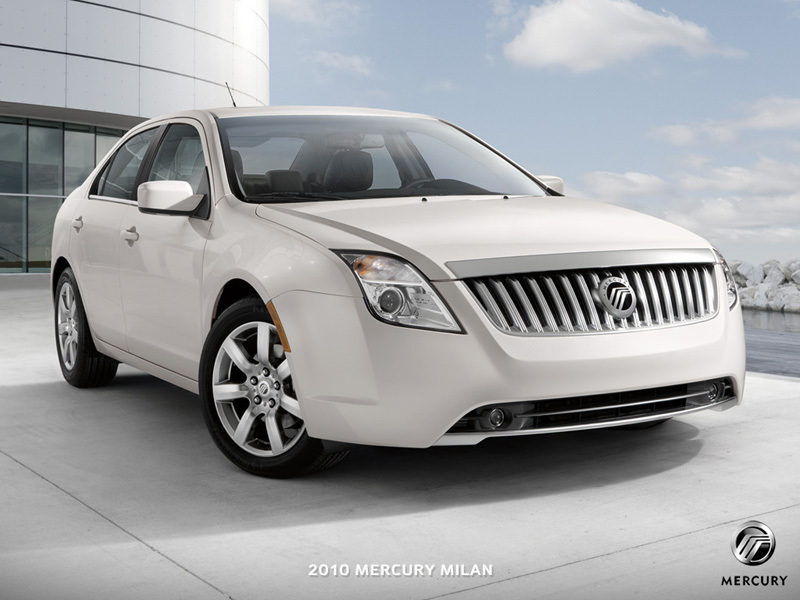 The Mercury Milan is the Ford Fusion’s hot cousin. I was one of the lucky few to drive the Fusion Hybrid last year, and during this most recent round of car shopping it was my first choice. The Milan Hybrid is a stunning car at a great price. The one I drove for this past week had an MSRP of $33,570. This is not a performance car, but for Los Angeles traffic (ugh) you don’t really need it. With a sturdy 2.5L Duratec® 16-valve I-4 engine, the Milan faked me out. I felt like I had plenty of power getting onto the freeway (yes I drove a few times at night just to be sure it could move), and the transitions from electric engine to gasoline and back again were smooth. I’ve now driven almost every hybrid on the market (forgive me BMW if I don’t take your 19MPG hybrid seriously enough to test drive it) and the Mercury has the smoothest transition of all. I just leased a Lexus hs250 hybrid, and I feel like this is the perfect car review for me. I’m really comparing apples to apples here. The Mercury in my driveway is $3,450 more than the Lexus, and they share some of the same fantastic features. With both the Lexus and with the Mercury I got 34 miles a gallon after a week of regular driving. This pleases me. I am a terrible driver with a lead foot. Were I to pay better attention the mileage would be better as it was when I drove the Ford Fusion Hybrid last year and averaged closer to 40 MPG. If I’m busy loving the planet, this is the right car for the job. The Mercury Milan has good but imperfect crash ratings. The front impact for driver and passenger received five out of five possible stars. Front seat side crash ratings were perfect with five stars, and the side rear seat as well as the rollover ratings received just four out of five stars. Good, but I’d like to see five stars in the back seat, us moms want to protect our kids. Although the interior leather has cream colored panels, the floors and backs of the seats are black. This is good when you have kids. Wears nicely. The car I drove had almost 11,000 miles on it. Granted it’s part of a well maintained fleet, but it still impressed me. Tight handling. I like this, remember me, leadfoot? SYNC I love the technology that Ford uses. It took me just a few short minutes to figure out the navigation, to connect my bluetooth and to be on my way. The UI (user interface) is smart. Trunk space: Enough for a dead body and a shovel. Go ahead, judge me. I happen to love Mercury, so I hopped in the car with a bias. Before Jane I had a third generation Mercury Capri which was red, convertible and MINE. I think of Mercury as a premium brand. I don’t necessarily think “luxury brand” but I know some folks do. My husband did not love this car. He liked it, and agreed that it’s a lot better than the Lexus, but when I said, “don’t you love it?” His response was, “it drives like an Enterprise rent a a car.” To be perfectly fair, the only reason I’m not currently driving this car full time is because it doesn’t lease out well. I love cars, and I love new cars, so I’ve resigned myself to leasing. I’m not sure if there isn’t a good lease rate because Ford is notoriously conservative (no bailout for Ford) or if it’s because the residual value is low. If I were the type to buy a car, this or the Ford Fusion Hybrid would have been my first choice. I’m just not that type. We’re going to have to agree to disagree on this one. I love the car, he does not. Part of me thinks he’s just jealous, you know, since I want to marry it and all. Considering I drove the car for a day (thank you, Jessica) — I have to concur. LOVED this car. And I’m a car snob. It handled well, the transitions were oh-so-smooth and the SYNC features were uber-cool and very intuitive. No manual needed. I drive a Cadillac CTS and it gets about 24 mpg in the city and it’s not even a hybrid.